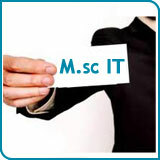 All candidates seeking admission to M.Sc. IT. shall be required to appear in a written JUET Entrance Test to be designed and conducted by the University of Jammu. The admission in the open category for Kishtwar Campus, University of Jammu will be made by the University strictly in accordance with the merit list. Degree examination of (10+2+3) pattern in the discipline of Science, Management, Commerce, Arts, Engineering, or Technology or any other degree equivalent of atleast three years duration with atleast 50% of the aggregate marks (40% for Scheduled Caste/Tribe candidates). Selection for admission to the programme shall be made through an Entrance Test as per the schedule to be notified by the Department of Computer Science &IT.